In Books & Reading, House & Home, Organizing. I used to clean my house because I didn’t want other people to think I’m a slob. Now I’m past the point of caring whether or not friends think my house is clean when they come over. It’s a gift of the thirties, I think. However, I’ve learned that I breathe easier in a space that’s clean and uncluttered. 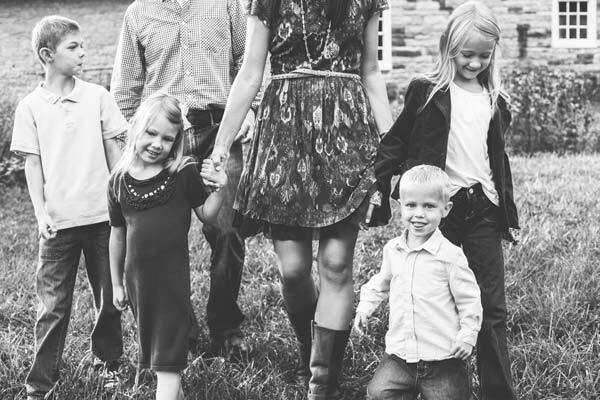 I’m kinder to my family; I think more clearly, I do better work. “Outer order contributes to inner calm,” says Gretchen Rubin. I don’t know if it’s true for everyone; it’s certainly true for me. Also: I would care very much if a friend slipped on a Lego and broke her leg (which seems like a real possibility, some days). This little tip eliminates the risk. A roomy, empty laundry basket (or a giant cardboard box, or Rubbermaid tote. Next, tidy up the surfaces. (This makes a huge difference in how a room feels. ) 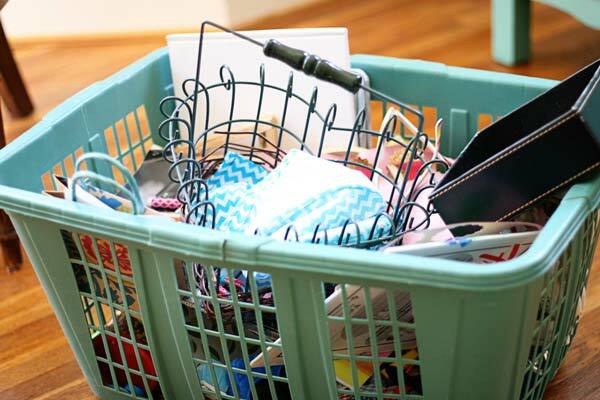 If you have too many piles to sort through just now, plop that stuff in the laundry basket. 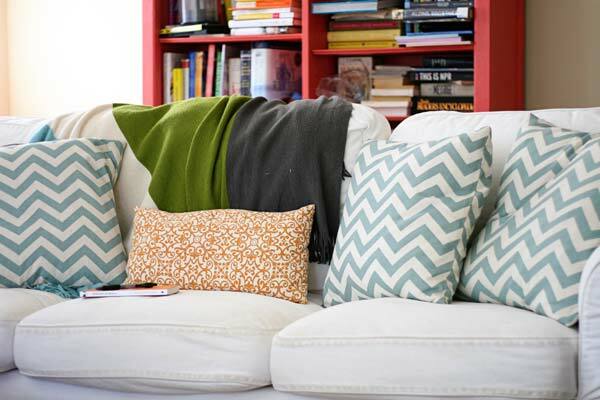 Straighten the pillows and blankets, push the ottoman back in place, put the books back on the shelf. When the basket is tucked away discreetly, you don’t notice the basket: you notice the clean, shiny floors and glorious empty surfaces. And when the clutter is gone, our living room feels like a much better place to live (and work, and play, and dream, and chat, and anything else you can think of). 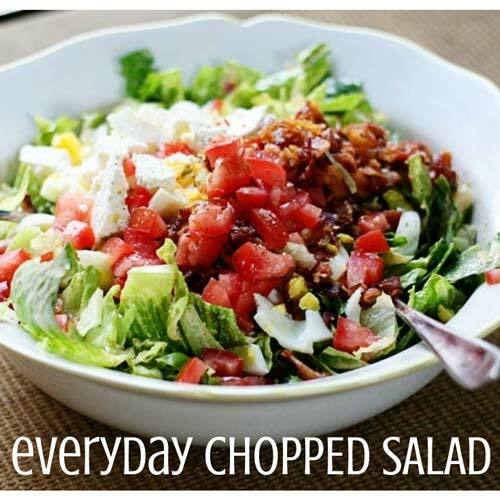 Do you remember my #1 Pinterest tip? That empty laundry basket will help you carry it out. 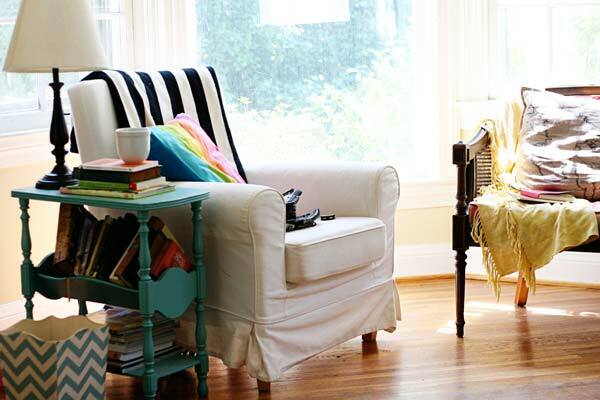 Do you breathe easier in an uncluttered space? What are your best tips for making it happen? P.S. Highly sensitive people, and when I realized my own house was making me cranky. Also, this book is a wealth of information/inspiration on stopping the clutter before it eats your living room. When I first met my husband, a single dad, he did this all the time and called it ‘triage’ cleaning. The problem was that the boxes full of stuff never got sorted. They were stuffed in a closet or the basement and forgotten until I found them later, sometimes years later. It has taken the better part of two years to unearth most of these triage projects and make him sort through everything. We have found just about everything from junk mail to life insurance policies to too small baby socks (his boys were 5 and 8 when I met him) to baby pictures to broken toys. I’d rather have the mess so I know where everything is. It is actually easier to make him put stuff away properly the first time than it is to get him to sort through boxes of triage stuff. There have been so many times I’ve wanted to haul the boxes to the curb. The only holding me back is knowing there is probably something important inside (baby pictures, insurance policies, court papers) that could be important. Since I don’t know what needs to be kept and what can go, only he can do the sorting that must be done. YES!!! YES!!! That is the problem with this strategy! My partner did it because he couldn’t face the conflict of trying to get our son to pick up his clutter, and now there are FOURTEEN boxes of random clutter taking up space in the basement. There used to be more; I sorted a few and found some things…like $40 in cash…that made me think the “picking up” was done too carelessly for us to discard the contents of these boxes. So, Anne, what do you do to make sure that the contents of the basket eventually get dealt with??? I live alone, but I use a similar strategy. I can have one small basket of random crap on a side table, but everything else is tidied daily. It’s really not that much work to hang up jackets and put things away right away, as my parents drilled into me every time I threw my school bag or shoes or whatever all over the living room when I was a kid. Every weekend when I’m doing actual housework, the pile gets sorted into shred/toss/recycle/donate or I find a place for it. Anything that doesn’t have a place but I need to keep it can go in the storage area in the basement (which is SMALL). My house it always tidy, but I still dread dusting, sweeping, vacuuming, and scrubbing bathrooms. You can’t really fake that part, unfortunately for me. I agree. . . the trick is giving yourself a basket limit/time limit to empty it later. . . obviously, you can’t cheat and just let the boxes pile up! Yes! I do the same thing, only mine is a “bottom of the stairs basket.” It’s one of my favorite household things. (That and others here: http://asimplehaven.com/a-few-of-my-favorite-things). Brilliant! But I think I might also add that if it stays in the laundry basket for more than a few days, it gets donated/pitched/moved to a secret garage sale location! I use a similar strategy and it makes all the difference to the state of my house, and my peace of mind! We must be messier than most though, because we need more than one basket! 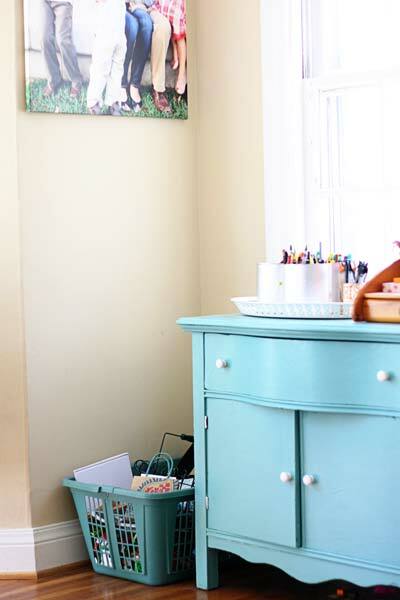 What works for us is a Hemnes storage sofa table from IKEA (http://m.ikea.com/us/en/catalog/products/art/00251814/). We put four of the Branas storage baskets beneath (one for each of my kids), and then the upper compartments hold library books, magazines, and papers. Once a week (or more frequently if they’re overflowing), each kid has to empty their basket. This system is a lifesaver for quick clean-ups and helps keep track of each kid’s things too– I can quickly put their things away if I do a quick cleanup when they’re not home and they know to check their baskets if they can’t find something later. Clean surfaces make me happy. We do piles, a stack of music always looks better then scattered. And I use baskets in my girls room, their shelf looks can look orderly in minutes just by putting stuff in the baskets. Gorgeous space, you have me wanting to paint something blue! My problem is that the baskets get left on the floor of my bedroom and time rarely permits to empty them. YES. I had a couple of piles recently that were bugging me, sitting right in my way in the kitchen, and when we had overnight guests coming recently, I just tuck them in a paper bag and tucked it at the bottom of the pantry. Instant relief – and now, a couple weeks later, I don’t even know what’s in that bag! They must not have been too important, which makes me think it’ll be easier to clean out once I do. My other fake-it tips: vacuuming and making the house smell good. (candle, simmering orange peels on the stove.) Then even I could believe our place was clean-clean! Those are great fake-it tips! I struggled with this for awhile – trying to find the balance between letting people into my real life and wanting the house to be clean for company. What I finally realized is that I was cleaning the house mostly for my own peace of mind, not theirs, because all that clutter is like visual noise that overwhelms me. So what I’ve settled on for guests is this: I like the kitchen table cleaned off, and the toys (mostly) picked up, and the bathroom is clean (the one thing I ALWAYS do before we have guests, since the guest bathroom is also the one my boys use). But it’s okay if there are dishes in the sink or they can see the laundry piled up on top of the washer.from where we sit at the kitchen table. Oh this is the best tip ever and used oh to often at our house. I am the queen of boxes and baskets of things that need to be put away. When I have a full basket it’s a good reminder it’s time to declutter and simplify life and get rid of things. 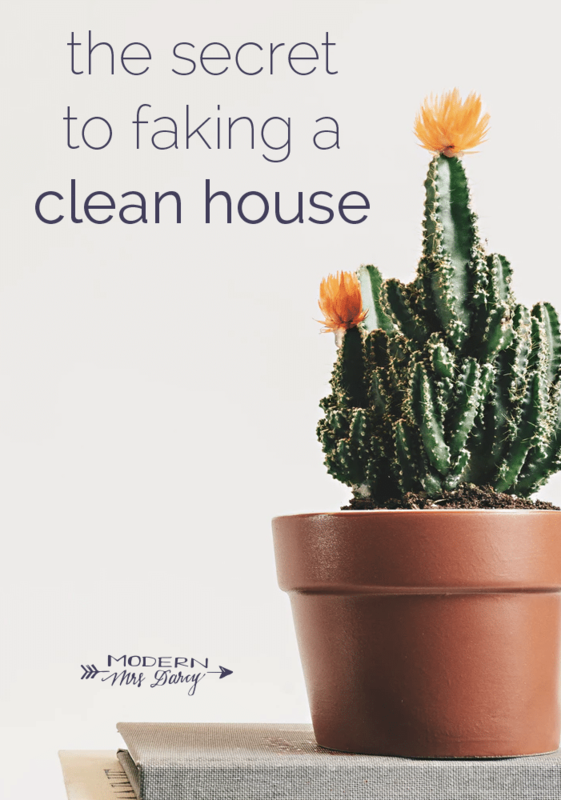 Great tip – though my house needs a real cleaning these days! The laundry basket method is how i vacuum! Best idea i ever had. It works Wonders for a speed clean. Good tips, Anne. Sometimes just straightening the pillows and folding the lap blanket over the back of the couch changes this-room-is-a-mess into what-a-comfy-place-to-relax. On messy houses and company though, I try to remember my favorite hospitality aphorism: If you’re coming to see me then come right over, but if you’re coming to see my house then give me three days! But in three days, it’ll be messy again! Good point, though; unless someone is coming over to BUY your house, grace needs to be given! Are you kidding? In three days I’ll barely have started cleaning! I’m laughing out loud… Which I love to do, so thanks! The laundry basket would be dangerous for me since I’d be like some of the other commenters who never unload it. But it’s a great idea for a rescue clean. What I do is just set a time, say 5 to 10 minutes, and put away as many things as I can into their places or into designated drawers (probably my version of the laundry basket!). My living room only looks clean because I picked up all the toys and took them to the (non-finished) basement. My postpartum eyes couldn’t take the clutter anymore. Plus, I wanted to see which toys they really wanted to play with. I’ve had ideas for a toy library for a while now. You guys, they don’t ask for anything! Two larger toy vehicles- that’s it! But I digress- a clear surface is where it’s at. It helps that I am not a big fan of figurines, etc. I love the sunshine on your wood floor! Enjoyed reading this. A picked up house looks like a clean house. But there does come a time when you must clean out those baskets! My granny always did this and she hid it in the bathtub (shower curtain closed of course) so that she would be reminded later to put the stuff away:)I had forgotten this neat trick but I know it would help me immensely! I do this, too! I love it because it makes the work less overwhelming, even for the kids. Plus if something stays in the basket long enough, I can see that it either has no dedicated home, or else that no one needs that thing any more. Easiest decluttering ever. “It makes the work less overwhelming.” Yes, exactly. I do this, but mostly because it is easier to put things away when I have all the like items together. I’ve also started to keep a donate box handy to toss things in as I come across them. It is amazing how quickly that box fills up! I put a hook in my closet that I hang one of those big reuseable shopping bags on and toss stuff in there that’s outgrown or ugly or whatever. You can’t see it unless you’re looking (so no kids to howl, “My favorite 2 sizes too small shirt with the stains and holes in it!!) and then I transfer it to a plastic bag when it’s full and drop it off at Goodwill. And they even give you a 20% off coupon. Win, win! I do better in an uncluttered space, but it doesn’t have to be perfect. My advice would be to pick what bothers you the most and put the most effort into maintaining that. My kids are old enough to pitch in so we do regular short clean up times through out the day- in the morning, at school lunch break, after school, before bed. This way, each time is short & stuff doesn’t build up too often. We also have once a week “room inspection” for the major clean up. Love your laundry basket idea! I use an IKEA bag. Actually, I use six IKEA bags for organizing the laundry closet, one for pool stuff, and one for tidying up. So easy to schlep multiple bags up/down the stairs at once! Hmm. We’ve got an IKEA trip in our near future…. Love the concept of “fake” cleaning. My family calls it “blitzing.” Thanks for the tip! We call this doing a white tornado. Actually, what makes me feel best is getting the dishwasher emptied soon after it runs, so the dirty dishes can go in and don’t build up in the sink. It’s a huge improvement even if the kitchen isn’t perfect. I hate dirty dishes in the sink! My mother never left the house without herself or “somebody” cleaning out the sink, and it’s a habit I’m glad I have. There’s just about nothing worse than coming home to dirty dishes, unless maybe it’s a dishwasher full of clean dishes screaming at you to let them out! I just couldn’t get in the habit of throwing everything in a basket because I knew that one would become two and so on. So I grab everything and put it in the room it belongs even if it isn’t put away and close doors. The rooms that need to be clean are our living room, kitchen and main bathroom the rest can be hidden with closed doors. I’m a person that is much calmer in organized and clean spaces so I try my best to keep things picked up on a daily basis and do at least one chore a day so that my house stays reasonably clean. After phase one of triage, PHASE 2 carry the basket box whatever around and deposit the stuff you collected in the correct locations. This usually takes less than five minutes. Another tip, if you hang up laundry…hang shirts on hangers as they come out of washing machine and hang on clothes line with clothes pin spacers to keep them separate, so they don’t all squish together. When dry have the kids pick out their own shirts and hang in their own closet. Or not and empty line as you need’em, they’ll look ironed. my hubby laughs at me b/c he thought I always had a clean kitchen when we met…little did he know I shoved all of my dirty dishes in the oven when he was coming over! lol Now, that we’ve been married 6 years…he knows the sad truth…I hate doing dishes! Ha ha, Lacy! I do that too!!! The minute I hear someone is on the way over, those unwashed pots and pans go right in the oven! I do also use the “laundry basket” quick pick method. When I have a chance to sort through it, I use my bed (forced to finish by the end of the day) and create a pile for each room where something belongs, or else it goes in the trash can. Usually it’s mostly trash or toys, so the piles are easy to deal with and put away properly. I have used this triage method for decades and it totally works for me, especially when we are about to go holiday leaving house sitters in charge. Works for cleaning out a messy car too. My trick which ideally happens the same day but this is the real world, is to bribe myself that I have to empty the basket while doing something else, usually TV. I watch very little, and mostly on demand, so can arrange to overlap the hour of watching And the hour of sorting into piles for each room on the house. Although I can fast forward through ads, I don’t, as that is about the time it takes to move the biggest pile up to its room of origin and put stuff away. I use this in our house too and then every other day or so will ask everyone to empty the basket knowing the remainders will be trashed or donated. Yes! When I was young my mom had a basket at the bottom of the stairs for my sister and I. Every night we had to bring it up and put all of our stuff away. I use the same strategy for my 12 year old daughter. I put all of her stuff that is out of place in a laundry basket and plop it on her bed and close the door. My husband’s stuff get’s piled on his desk. Reading Gretchen Rubin & Marie Kondo have made this an much easier task! I have a friend who used to put dirty dishes in the bathtub and close the shower curtain right before a dinner party. Wipe down the counters and voila-clean kitchen-until time to take a bath!